London is to host the start and finish of the 2013-14 edition of the Clipper Round the World Yacht Race, leaving the capital on 1 September 2013 and not returning until July 2014 after racing 40,000 miles visiting 14 ports on six continents in the world’s longest ocean race. The announcement was made at St Katharine Docks in front of Tower Bridge by Mayor of London Boris Johnson and Clipper Race founder and chairman, the legendary yachtsman Sir Robin Knox-Johnston. Sir Robin became the first person to sail solo non-stop around the world in 1968-69 and established the Clipper Race in 1996 to offer amateurs from all walks of life the opportunity to experience the thrill of ocean racing and a circumnavigation of the planet. 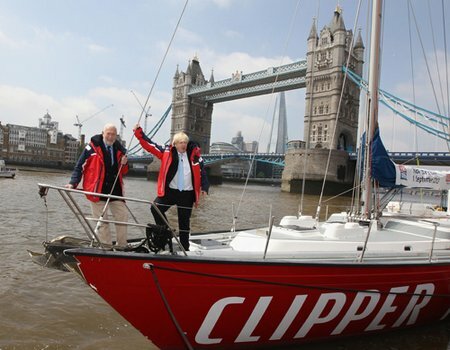 “Playing host to the Clipper Round the World Yacht Race will once again see London showcasing why it is the best big city on earth in which to hold major sporting events. It’s a fantastic honour for the capital to mark the beginning and end of this feat of human endeavour, which will not only provide an awesome spectacle for hordes of sailing fans, but also give a huge boost to the wider London economy. The event will see the debut of the third generation Clipper 70 ocean racing yacht. The twelve-strong matched fleet will be hosted in a race village at St Katharine Docks, central London’s only marina and the official Clipper Race start and finish port. The boats will begin and end their global journey in the Thames in front of Tower Bridge. “This will be the ninth edition of the biennial Clipper Race, a unique global event, and what better place to host the start and finish than London, in front of one of the best known landmarks in the world. This will be the first time the capital has hosted a global yacht race start and finish. “We have a huge following and I’m proud that this will showcase London to our fans and partners around the world as well as making a significant economic impact in the local economy as crew, officials, sponsors and guests visit and stay in the area to participate in the event. Over 3000 people have participated in the Clipper Race over the last 17 years in what has become the world’s premier ocean race for non-professional and novice sailors. The new enlarged fleet has been commissioned in response to the growing demand for crew places and will serve the event through to 2020. The Clipper 70s will make a big impact in St Katharine Docks and on the Thames. The Clipper Race fleet is expected to start arriving at St Katharine Docks from 24th August. The Clipper Race has been a partner of the GREAT Britain campaign supported by the Mayor’s promotional organisation London & Partners, flying the flag for UK trade, tourism, culture and sport last year, capitalising on the Diamond Jubilee, Royal Wedding and London 2012 Olympics, and helping to deliver legacy through a London start and finish and an international campaign in 2013-14. The race will showcase London and the UK to its international participants, host ports and partners. It forms part of London & Partners’ programme of world-class major events for the capital as a legacy from the Games. The GREAT Britain campaign is the Government’s most ambitious international marketing campaign ever and showcases the very best of what Britain has to offer in order to encourage the world to visit, study and do business with the UK. For the duration of the race, the organisers Clipper Ventures will be working with the FCO, Visit Britain and UKTI to deliver events promoting the UK and its business in all ports of call along its circumnavigation. The race will be promoting distinct areas of GREAT Britain: London as a unique city to host international events; Britain as a country to visit for Adventure tourism; Britain’s companies for exporting and investment opportunities.